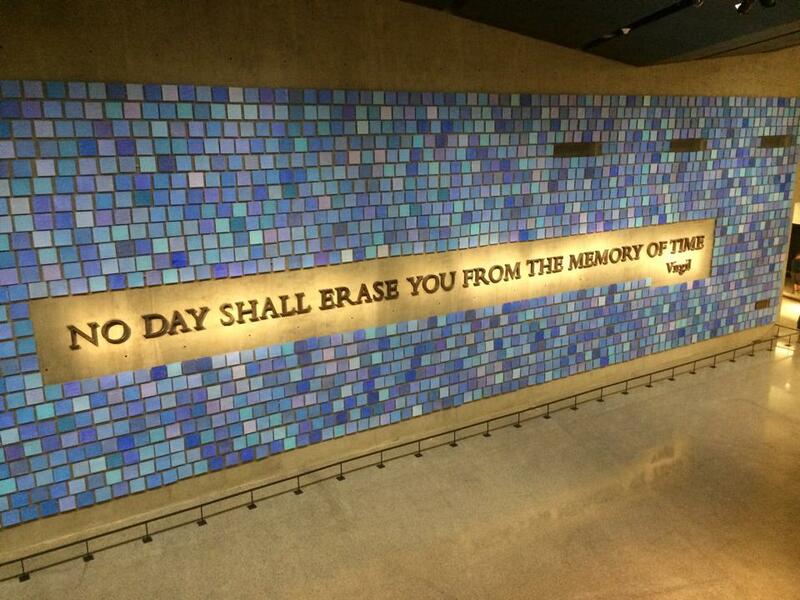 A couple of weeks ago I was in New York on business and I went to see the new 9/11 Memorial Museum. It was, of course, a deeply powerful and moving experience. They did an amazing job of capturing the stories of that day. Not everyone will be ready to relive that awful time in such visceral detail, but for those who are, I highly recommend it. I’ve read that many New Yorkers are choosing not to go, for various reasons. But for those of us who saw the events unfold only on TV, I think it really helps to better understand what people who were there went through. I did not personally know anyone who died in the attacks but, if it’s possible, I did feel an emotional attachment to those buildings. I mean, when you’re an 8-year-old boy, what could possibly be cooler than the tallest building in the world? And there were TWO of them! I loved the gleaming silver of the towers, the narrow vertical lines and, at the base, the trident-shaped columns that, together, gave the towers a church-like appearance. All this to say, September 11 was heartbreaking, not just for the loss of all those people, but for the scale of destruction. I remember that morning when Matt Lauer said the first tower collapsed, I was in total disbelief. I thought he was insane. So among the first things you experience is the memorial to the buildings themselves. As you walk down the ramps to the original foundations, diagrams help you fix your position in relation to the towers. When you get to the bottom you see the footprints of the buildings are traced by remnants of the “box columns,” cut off at foundation level by the recovery workers. From this perspective, the towers seemed surprisingly small. And then there’s the original slurry wall, a heroic character itself in that day’s story, seen so many times on TV and on a visit to “the pit” in 2002. But to see it at eye-level and learn more about it gives you a true appreciation for the genius that went into the buildings’ engineering. Among the exhibits are crushed vehicles, pieces of the aircraft and, most dramatically for me, the twisted, mangled girders, showing the force of the destruction. Inside the exhibit rooms you have audio, video and images documenting the horror of the day. It’s almost overwhelming, but tastefully presented, I think. No photography is allowed in those areas, and they offer quick exits at various points for people who want to leave. Most moving for me was the In Memoriam room. All four walls of this giant hall are covered in row after row of photos of those who died in the attacks. Interactive kiosks let you look up and read about each person. When you get up close you see that those colored panels are watercolor drawings, each one an attempt by the artist to capture the color of the sky that morning. There is one for each of the 2,983 people who died in the attacks on September 11 and in 1993. I love the quote, too. People are always saying, “Never forget!” As if that’s possible. I prefer the positive message of remembrance. Back at ground level, the memorial pools are also beautiful and moving. There is something about water that creates such a tranquil feeling. I saw them last year at Thanksgiving when it required advance admission and long waits, but now the plaza is open and easy to visit. Very worthwhile. And free, while the museum itself charges a pretty steep $24. Like I said, the museum is probably not for everybody. It’s a deeply immersive experience, capturing all the sights and sounds of the day and its aftermath. I spent almost three hours there and could easily have spent four if I had the time. I went on a weekday afternoon and there was a line, so it took about a half-hour to get in, but you can get advance reservations if you’re a planner. It was still pretty crowded, and those who lived through that day might chafe at experiencing it elbow-to-elbow with tourists of varying levels of reverence for the event. For me it’s a can’t-miss experience that I highly recommend.